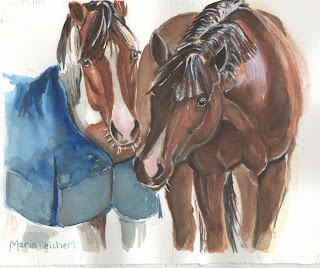 8 by 10 inch watercolor of the two young geldings in the paddock. These two are always looking to get into something, took some photos of them on a cold and snowy day, they were playing and pulling on each others blankets. When I took this photo they were playing tug of war with a stick, ( I left the stick out of my painting) and they looked up as I was taking the photo, looking so guilty! Thanks Pat, I could watch them for hours, they are so funny! Another beautiful painting! What silly guys! They remind me of two geldings we used to have that loved to pick up their feed dish and pass it back and forth to each other! So fun to watch! Thanks Theresa! It seems I enjoy the paint horses, working on a thoroughbred race horse next, may be done in time for the Derby!? 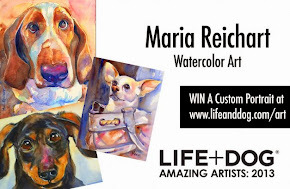 Maria, I love the way the coats shine! Thanks Sheryl, it was one of the sunny but snowy days, and I tried to capture all that sunlight, thanks for noticing. Why thank you Diana, you have made me want to go paint!!! Thanks for the encouragement today.